Weird flocks are fun. 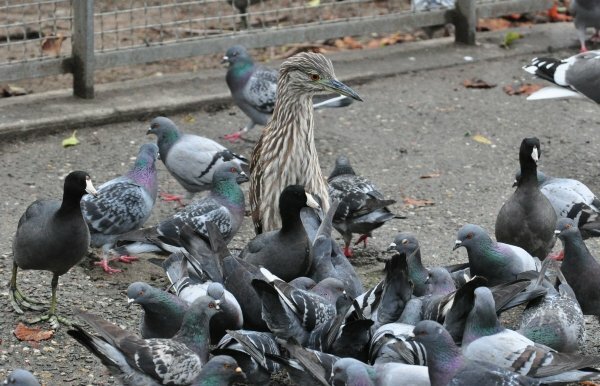 One does not typically find a Black-crowned Night-Heron mixed in with Rock Pigeons and American Coots. I think the night-heron knows it too. Thanks for stopping in again birders. Today’s post is as simple as it can be. FLOCKS. You know them and you love them…except when your car gets smeared in gull or grackle feces. Big flocks of birds are one of nature’s greatest wonders….how do they end up in those formations? How do they fly so fast without colliding? How can they communicate when they all seem to be making so much noise? How can they seemingly all agree on where to go? Could a Sharp-tailed Sandpiper be mixed in with that flock of Pectorals? As the world’s leading ornithologist, I can only offer you one piece of advice when sorting through a flock of birds. ALWAYS assume there is some other bird species in there that you have not found yet. The number of serious rarities that birders have missed over the years because birders “gave up” on a flock is estimated to be 938,971, and that is the figure for the Lower 48 alone. If you can somehow convince yourself there is a rare bird to be found in every flock you look through, it won’t be long before you start finding more so-called “good” birds. I don’t believe in perpetual optimism (I’m just not wired for it), but I think it will do you good in this situation. 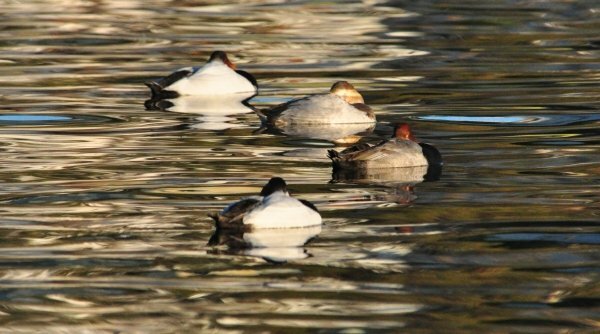 Birds blend together in some mixed flocks, like this Redhead mixed in with Canvasbacks. Lake Merritt, Oakland, CA. Other flocks don’t come off as being so homogeneous. 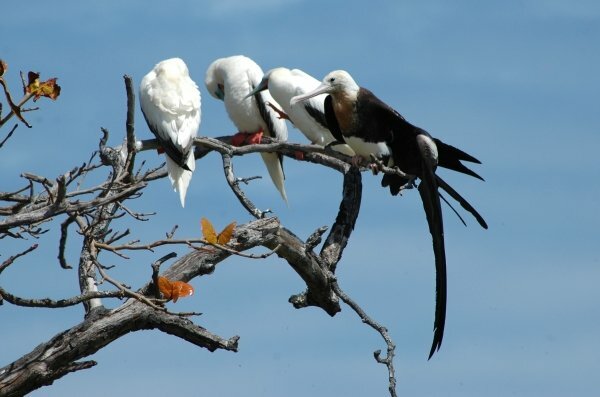 Great Frigatebirds are infamous for assaulting boobies (Red-footed Boobies, that is) in the air, but when perched they seem to get along just fine. Midway Atoll National Wildlife Refuge. Crested Auklets form some of the biggest, most impressive flocks and formations that I have ever seen, on islands in Alaska. Look carefully and you can pick out some Least Auklets as well. Buldir Island, AK. I think you need to have at least three birds to constitute a flock. Here is a flock of endangered species. 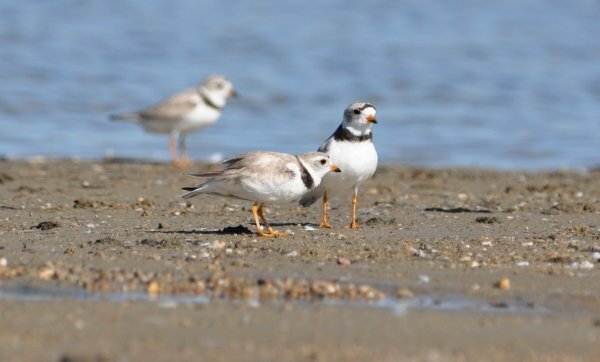 These Piping Plovers were photographed at White Lake, North Dakota. Certain flocks of birds really grab your attention. You may be happy to have a flock of chickadees visit your backyard, but it is difficult to ignore hundreds of American White Pelicans streaming by. Des Lacs National Wildlife Refuge, North Dakota. Some birds breed in flocks, at least in part to avoid predation. 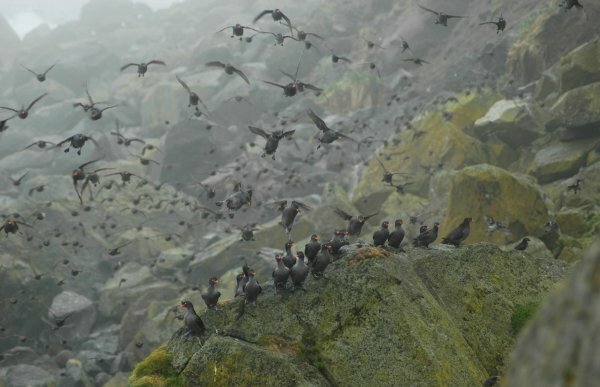 Nesting on steep cliffs makes it practically impossible for mammalian predators to reach them. 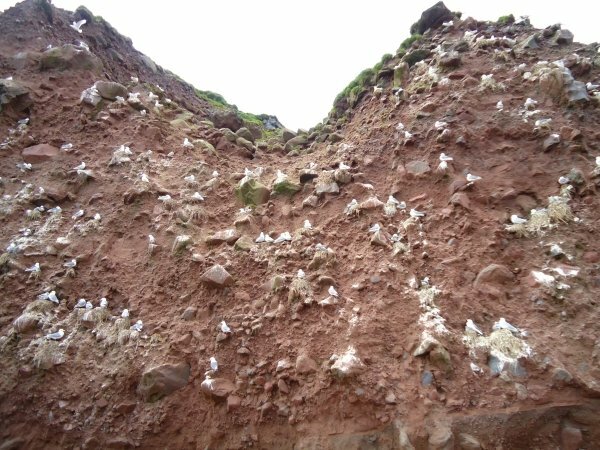 These Black-legged and Red-legged Kittiwakes only need to fear gulls and Peregrine Falcons, although bad weather and erosion do take their toll on nests. Buldir Island, AK. Ross Perot once said “Eagles don’t flock, you have to find them one at a time.” This is often true, but many other raptors do form massive flocks during migration, like the Swainson’s and Broad-winged Hawks pictured here. Turkey Vultures are also mixed in, and can form massive kettles that many birders never get to see. Chavarrillo, Veracruz, Mexico. Shorebirds, of course, are one of the groups of birds most known and loved for their social tendencies. What birder isn’t turned into a drooling, speechless mess when confronted with thousands of plovers and sandpipers? 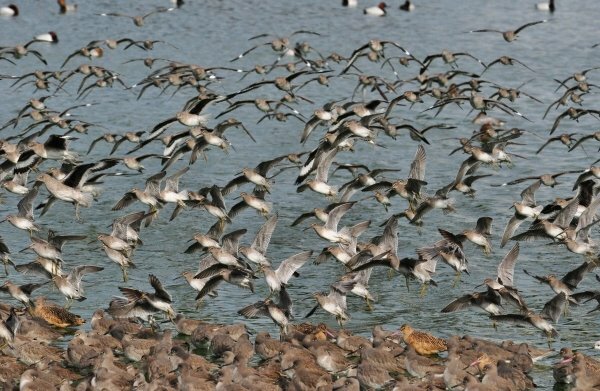 These Willets, Marbled Godwits and Long-billed Dowitchers are coming in to roost at Redwood Shores, CA. 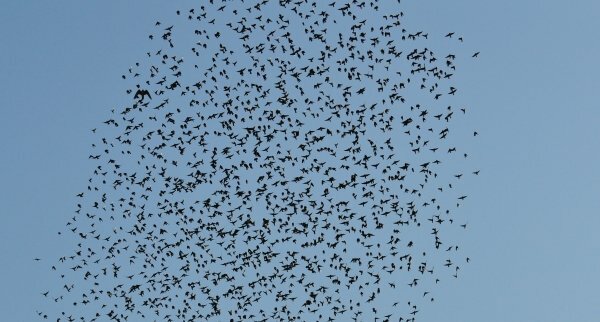 Flocks are formed for many reasons. In the case of these Tricolored Blackbirds, they are formed for DEFENSE. This tactic worked against the Peregrine Falcon in the upper left corner of the flock, who came up empty-taloned. Abbott’s Lagoon, Point Reyes National Seashore, CA. Some flocks are not for everyone. 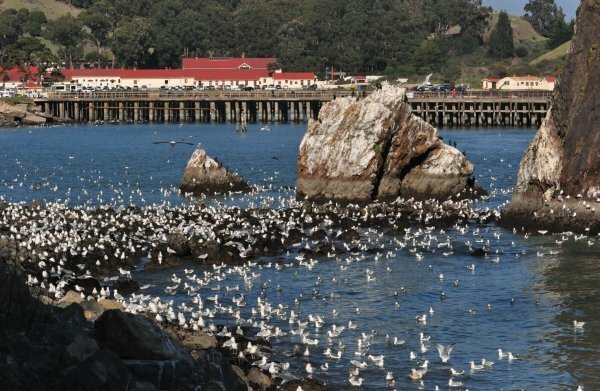 The same massive gull flock that would bring tears of joy to the eyes of some birders (indeed, this flock contained both Iceland and Slaty-backed Gulls) strikes fear into the hearts of others. Gulls are not easy to identify, you know what I’m saying? Fort Baker, Sausalito, CA. Being the world’s leading ornithologist has its perks. Most birders usually have to be content to watch flocks. I have taken it to the next level, and actually join flocks. 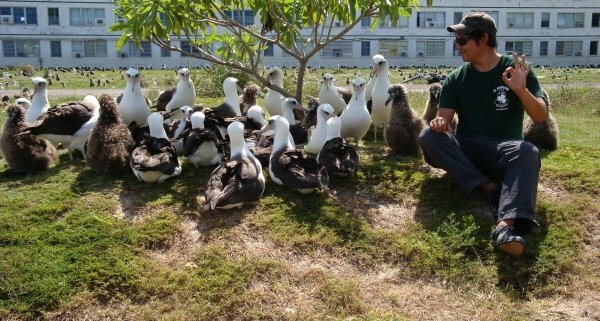 This is my flock of Laysan Albatross, on Midway Atoll. Mess with me and you mess with my flock…they will not hesitate to vomit concentrated squid oil on you. Smelling this is worse than death itself. That first pic alone nearly made me choke on my coffee. If I mess with you, would you send your flock of Laysan albatrosses over to Germany to vomit squid oil on me? Seeing 25 Laysan Albatrosses is definitely worth a bath and a dry-cleaning bill. @Jochen – My flock is very loyal to the Pacific. Yes, it is worth it…but you would probably have to walk naked through a car wash to get the smell off your skin. 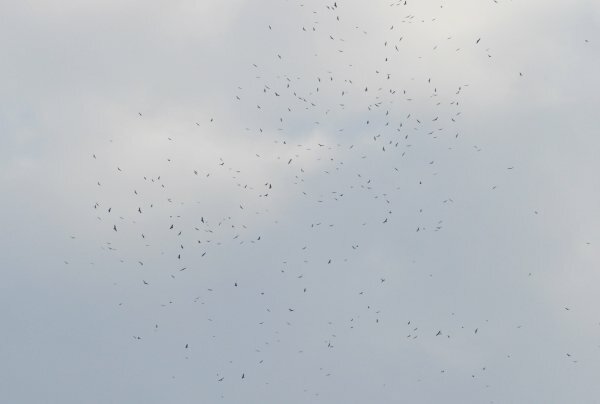 Sharing a photo of a huge flock of Tricolored Blackbirds is just showing off. @Mike – If it makes you feel any better, a few of those were Red-winged.